Eating and Feeling Well with SCD and Paleo. What's your favorite cake? Mine is Chocolate Mud Cake. Since I can't have the chocolate anymore, White Chocolate Mud Cake sounds pretty good. These are my first try at making a White Chocolate Mud Cake- Paleo style. :) I made a huge white chocolate mud cake for my daughter's 18th birthday earlier in the year and I'd really like a version I can eat! These turned out really well. The cacao butter makes them nice and moist and gives a lovely richness of flavor. You could try putting these in cupcake papers, but I didn't want them to stick. I found they came out of the pans well after they were greased with coconut oil. Grease 8 muffin pans with coconut oil. Beat eggs and honey with electric beaters. Add coconut flour, baking soda and vanilla powder. Add melted cacao butter and mix. Spoon mixture into 8 greased muffin pans. Bake for 12-15 minutes until risen and top springs back. May be a little moist on top but will firm up on cooling. Beat the solid coconut cream with electric beaters. When cool, tip cakes out of pans and cut a shallow circle from the center of each. Scoop a tablespoon of the coconut cream with jam into the top of cakes. Cut circular disk in half and arrange in cream/jam. 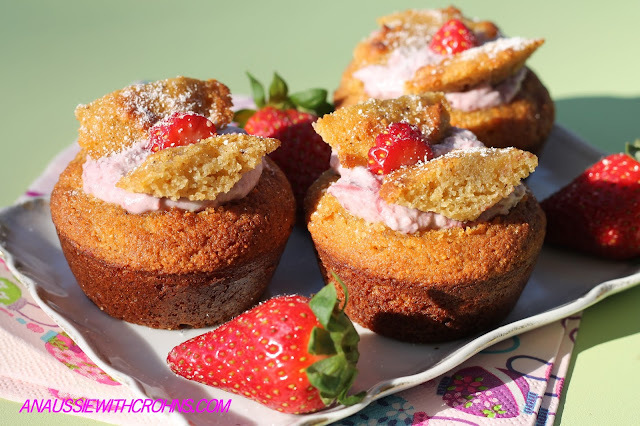 Sprinkle with coconut flour and decorate with strawberries. Keeps well in the fridge for a few days. These look lovely-I think it's time for me to take the plunge and get some coconut flour! I made these this morning! so yummy! I used a small amount of almond meal as well, i thought it was a bit runny. Hi, I wonder if the cupcakes freeze OK for a few days. Really looking forward to giving this recipe a go. Yes, they freeze very well. Enjoy! Hi! I'm Deb. Welcome to my blog! I manage my Crohn's Disease with the SCD & Paleo diet. I love food and experimenting with recipes that are grain free, refined sugar free and lactose free. © An Aussie With Crohns.. Awesome Inc. theme. Theme images by molotovcoketail. Powered by Blogger.